Powerful moments that we experienced as parish family. That’s what I take away from the last few days at MMOC. On Holy Thursday, at the Mass of the Lord’s Supper, we heard the story of Jesus washing the apostles’ feet. Allie Dunkley was the penultimate of 12 people whose feet Fr. Konopa washed. It was a powerful witness of servant leadership. After the Mass we adored his Eucharistic presence for the first time in our parish hall. For the first time in several years we didn’t have to squeeze into and out of the mother’s room; we could all be together. On Good Friday the mood was somber. We heard Fr. Konopa and Dn. Sage proclaim the Passion story with pauses for musical reflection that were beautiful. We thank our Director of Sacred Music, and our sister in faith, Mary Jo Lium, for all her work these last few weeks. Sadly, her father recently sustained injuries in a fall that claimed his life on Saturday. Our musicians, who love Mary Jo, honored her by rallying at the Easter Masses. Their music was inspiring and beautiful. After the traditional Good Friday prayers of petition, Fr. Konopa carried in the cross and we all came forward to venerate the sacrifice that happened on that wood. I think about Mary, his mother, our mother, standing there, looking up at her son dying, not fully understanding yet trusting, pierced by the sword of grief. I imagine the resurrected Lord appearing to his mother. Of course, he would have done so, and what a moment that must have been! 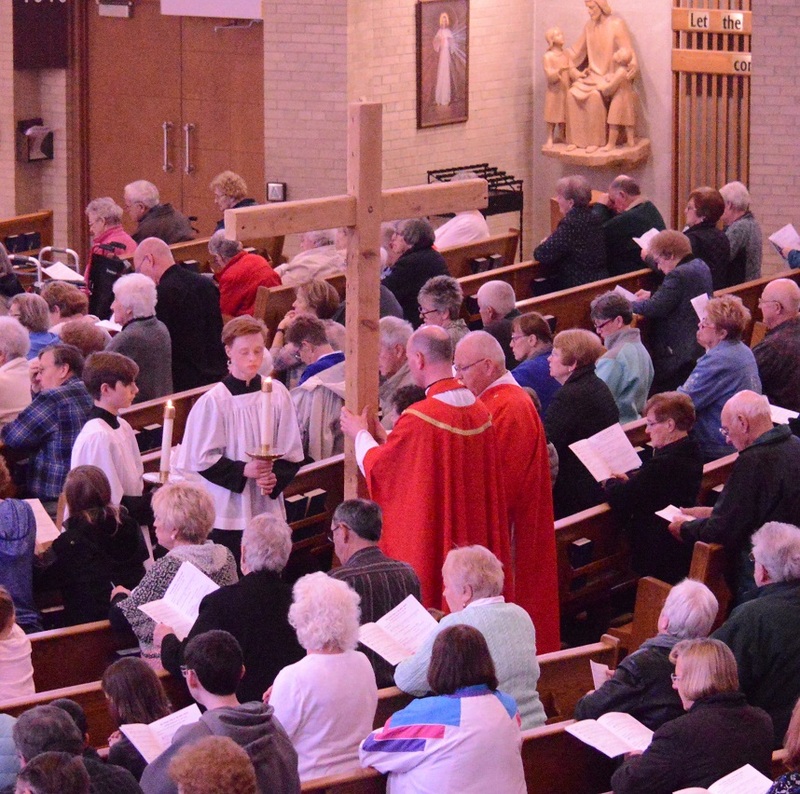 On a cold, breezy Holy Saturday evening we gathered for the Vigil Mass. The Easter fire, the antiphon (sung so wonderfully by Dn. Sage), and the several readings trace the arc of our relationship with God, our light in darkness. It all culminates with the empty tomb. Our faith rests on knowing that he rose. 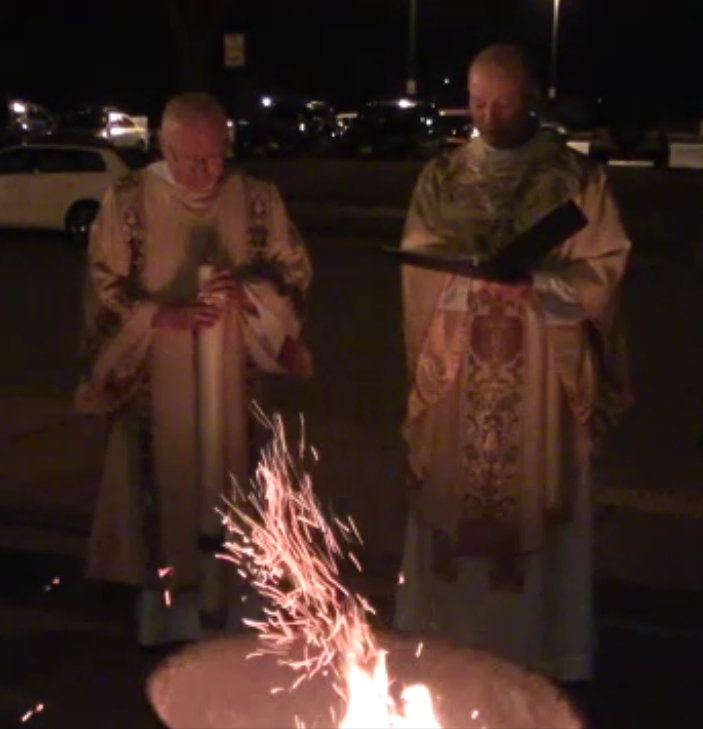 I confess a child-like fascination with the Easter Fire and the candles we all hold during the Mass. It’s easy to imagine early Christians huddling around a fire in the desert chill after the Lord was put to death. Yet watching people light each other’s candle speaks of spreading the Holy Spirit. The feeling I take away from the last few days at MMOC is gratitude. Grateful for the God who loves us, the Son who saves us, the Spirit who sustains us. Grateful for my brothers and sisters in faith. Grateful for the warm blanket of love that is our parish family.